It’s been a while since I’ve added any recipes to the site. That’s not because we haven’t discovered amazingly delicious recipes–almost every week we’ve found something that’s a “keeper”! Mostly, finding time to post is challenging, and with so many sites with great recipes, I always seem to find enough new recipes that we are don’t repeat too many recipes–when we do, it’s easier to just look back at a few weeks’ menus and pick to best ones. But I have a few photos from some recent meals and this Chicken Pot Pie Skillet Pizza from Cooking Light was so good we’ve already done it a couple of times. 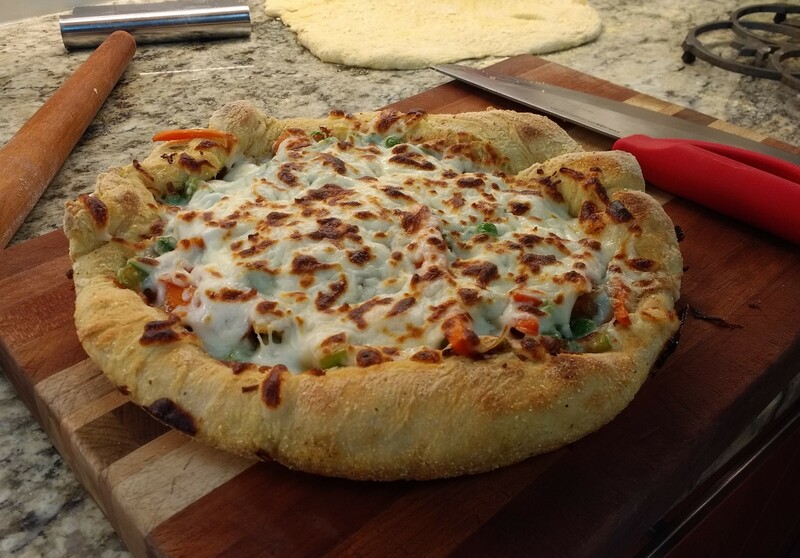 A delicious mashup of chicken pot pie and pizza. Makes two pizzas. 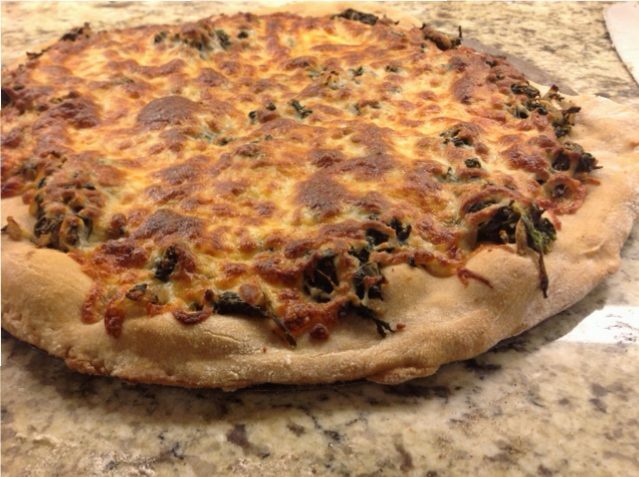 Roll the pizza dough out to fit the bottom and sides of the skillet in the oven. Place 1 of the dough rounds in it covering the bottom and going up the sides. Change the oven to broil and broil for a couple of minutes until the cheese is melted and browned. In Googling around for ideas for a holiday treat auction, we ran across photos of these. 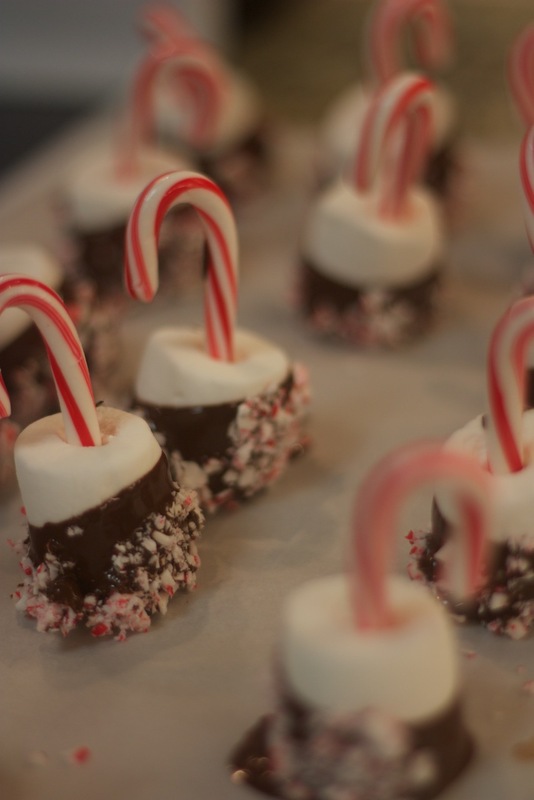 They are fairly easy to make, yet a nice and somewhat different treat for the holidays. It probably would have helped if it weren’t 80 ˚F in December to make these, but such is life. The chocolate took a while to cool, making the process a bit slower than expected. These are a very easy treat to get kids of any age involved in! They kept fairly well for a few days in the fridge. But probably wouldn’t want to push it much beyond that. Once they are cool, store in a tupperware. 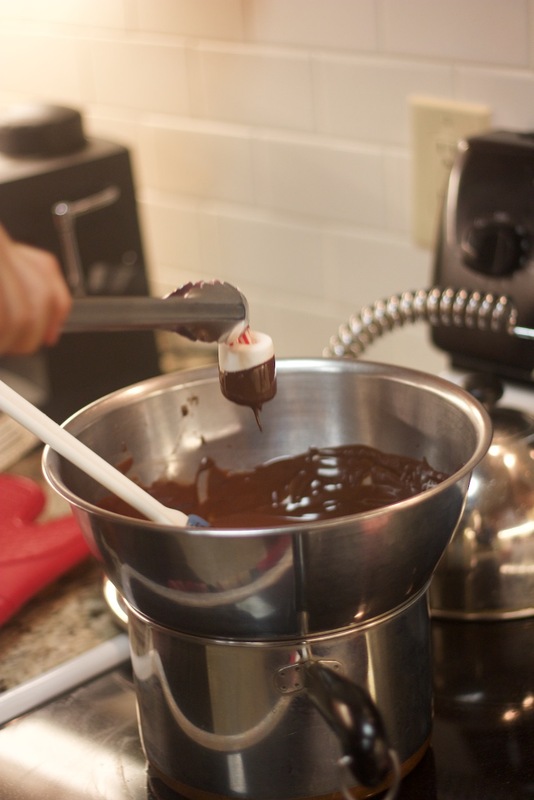 Using a double boiler or a pan of water with a bowl on top, heat the chocolate to melt it. What a delicious summer salad from TwoPeasAndTheirPod.com. 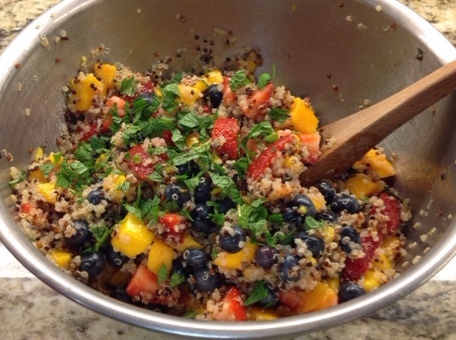 Loved the dressing of this and the combination of quinoa with the fruit made a yummy side salad. As indicated in the original recipe, it is very adaptable to the fruit on hand. Living in the south, you would think that okra is everywhere. But really we don’t run into it that much, and when you do see it, chances are it is breaded and fried. There is nothing wrong with fried okra, but surely there’s more to okra than that?!? After being encouraged by our 10 year old to purchase okra, I was on the lookout for a somewhat different way to prepare it. I found a couple of recipes for charred okra, one from Martha Stewart and another from ChowHound. I had planned mixing things up between the two, but I was late getting home and my wife went with the grilled version. They were delicious and all eaten up quickly. A tasty addition to our recipe file! The kids did almost all the work on these. They loved making the dough, forming and filling the cookies. 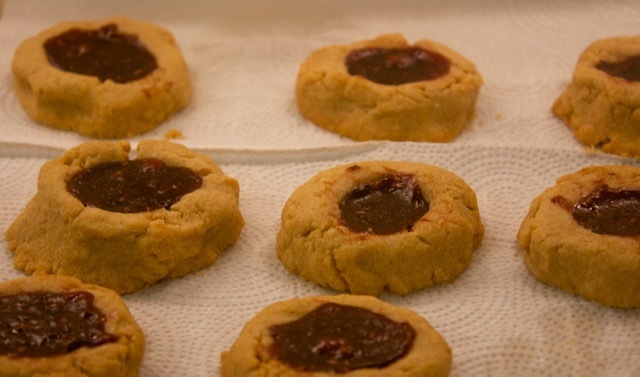 And of course devouring them–make sure to cool well, the jam stays HOT for a long time! There’s a bunch of recipes out there, but I liked the simplicity of this one from About a Mom. Cream together butter, sugar, and egg yolks. Mix in flour mixing until a soft dough forms. Pinch off pieces and roll dough balls in your palms to make 1 inch balls. Place balls on cookie sheet and make a well in the center. Bake for 8-10 minutes until golden on the bottom. Remove and cool on wire rack--Jam is HOT, be sure to cool. We’ve managed to make it out to Cymplify a few times for their 1st Friday Food Truck Rallies. It’s always fun to get a few dishes from different places, enjoy a good beer, nice music and run into random friends. 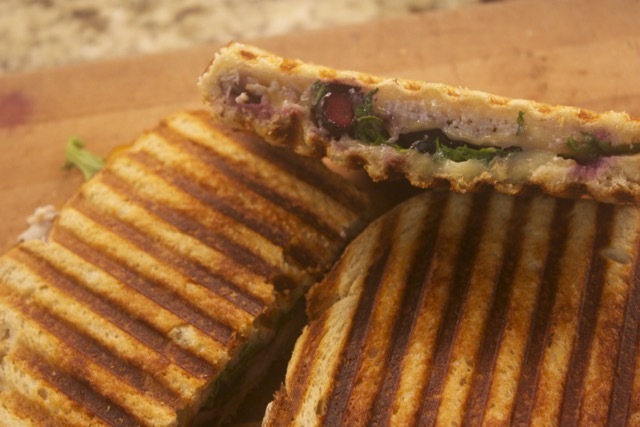 Soup to Nuts is one of the regular food trucks there and one night we had a delicious sandwich there that inspired this panini. Many variations could be made, but I highly recommend keeping the blueberries. OK, this isn’t much of a recipe, but do you really need one? Here’s something for those that want more detail–just add a handful of blueberries. 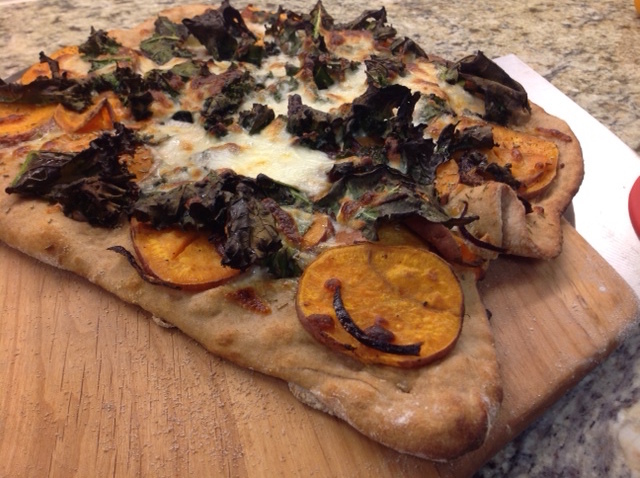 Trying new recipes is really the main purpose of this blog. Every week, I rummage around the web looking for new recipes for our meals. Sometimes we find a recipe that we use over and over, though even the most repeated of our recipes has only been re-used 4 times. I am constantly amazed by the variety of recipes out there, and that we’re closing in on 4 years of menus and there’s always more recipes to try. When we find one that turns out well, I’ll make a note of it, perhaps snap a photo and, for some really great ones, write up the recipe, especially if I’ve modified it a bit. This recipe is one that I almost skipped over because the original is a pdf file (often problematic) and is written to make 48 tacos by a chef at a restaurant–all flags that this could go badly in my hands. But what we ended up with was so delicious that it had to be written up! The flavors and textures were amazing! The recipe below is probably a poor rendition of Richard Sandoval’s Duck Carnitas Daikon Tacos, but wow, they are delicious! I simplified this a lot–perhaps too much?? Be sure to look at the original recipe and follow it where you want. I am sure duck would be delicious, and I’m not sure what Peking duck is, but sounds like it’s kind of orange-flavored, so I opted for chicken thighs and brushing with marmalade since we had some. You could steep the sauce overnight, but hadn’t read that part and it was fine without it, plus we used ground coriander, and finally grated orange zest, so no need to remove the solids. Anyway, enjoy and let me know if you try it. I am sure we will do them again and I’ll update the recipe and add some more photos–this was a cell phone shot taken at the table when we realized just how delicious these were. Barbecue the chicken thighs, brushing with the marmalade in the last 5 minutes or so. On a tortilla, place a few pieces of daikon and then apple. Add half a chicken thigh. I adapted this from this recipe at TwoPeasAndTheirPod.com. Raise the oven to 500F. 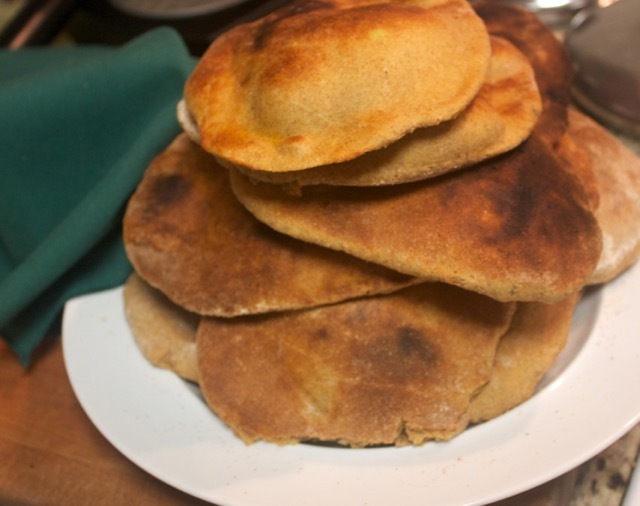 Bake for 10-15 minutes or until crust is golden and cheese begins to brown.